The Best Thing Since Sliced Bread | SB on food, frame, fluid, and feasting. I love trying “foolproof” baking recipes, unintentionally messing them up, and proving that no, they are not foolproof. But this New York Times recipe for Chocolate Dump-It cake actually worked. If a 9 months pregnant lady with a need to pee every 5 minutes, an aching back, and an intense chocolate craving can successfully make this, anyone can. A few notes: I used a bundt pan because I don’t have a tube pan, worked fine. Definitely take the recipe seriously when it says to generously flour and butter the pan – I thought I did a good job but still had a few chunks missing from the top when I unmolded the cake (which doesn’t really matter because you cover it with icing). I think I’d prefer a little more chocolate and a little less sour cream in the icing, it was a bit too sour for me. And I used the double boiler per the recipe, but you could just as easily melt the chocolate in the microwave and stir in the sour cream later. But all in all, easy, very moist, and delicious. I immediately wished I had purchased raspberries and whipped cream to serve with it. Next time. This recipe appealed to me because it is geared toward those who work in the food industry, as I do. What I didn’t realize is that it would turn out to be an excellent, quick red curry that is easy to alter as you see fit. I served this over chinese egg noodles, but it would be great over rice. I added sliced peppers, you could use whatever vegetable you wanted – eggplant, baby corn, sprouts, whatever. Even the shrimp is up for grabs- make it completely vegetarian, use chicken, pork, or beef, whatever. Thanks Mario. Last night I made fettuccine alfredo, because it is 10 degrees here and if you don’t eat something really fattening and delicious, you die. I’m not posting a picture of my dinner, because truthfully, fettuccine alfredo is pretty gross looking and the sight of it really takes away from how wonderful it tastes. Here is the recipe, from Giada. Now that I know what a difference the lemon makes in this dish, I’m never making it without. I did not include the nutmeg, because I think that’s stupid. 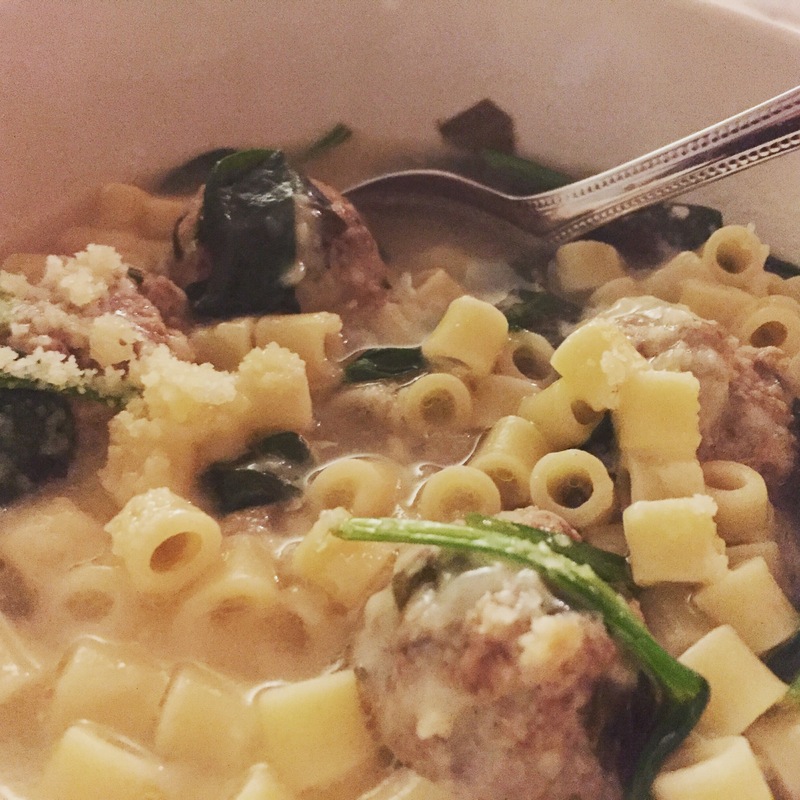 It turns out that Italian Wedding soup is pretty easy to make, pretty easy to make a lot of, and pretty easy to make delicious. It is also pretty tasty on a cold winter night. Mix the ground beef, half of the onion, half of the garlic, half of the parsley, 1/4 cup parm, bread crumbs, milk, and egg in a bowl until combined. 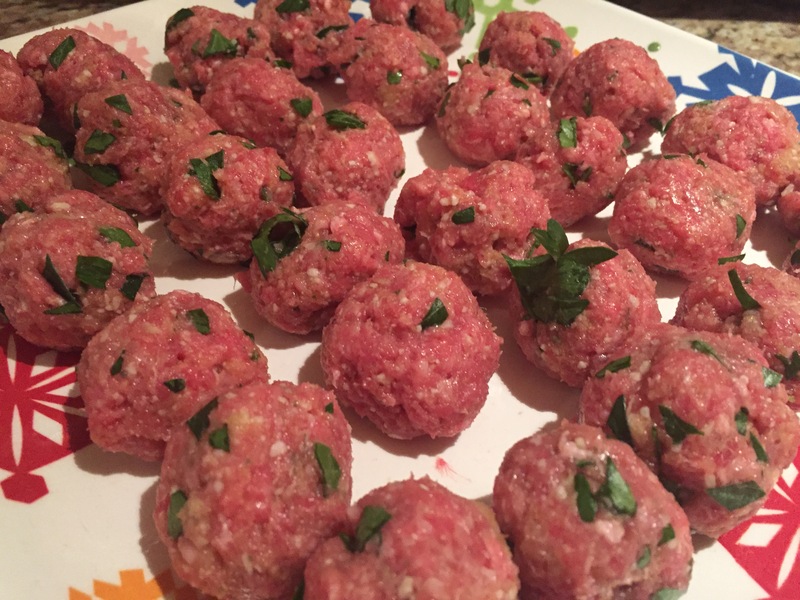 Roll tiny meatballs and place on a plate, then put the plate in the fridge so they can firm up a bit. Saute the remaining onion and garlic with a teaspoon of olive oil on medium heat. Throw in some salt and pepper, stir for a few minutes. Add the wine, cook for a few minutes until slightly reduced. Add the chicken broth and lemon juice, cook on high until boiling. If you have some time, cover the pot and let it simmer for 30 minutes. If not, turn the heat to medium high, and throw in one cup of uncooked pasta. (If you like more pasta, cook the rest in water in a separate pot – you don’t want too much pasta cooking in the actual soup, it will overwhelm the broth). Then, toss in the meatballs. In about 7 minutes both your pasta and meatballs will be cooked. Throw in the spinach and stir it around, then ladle out the soup and serve, topped with the remaining parm. Authenticity: Hoagie must be baked, and must have Italian dressing, no mayo. Freshness: Vegetables (lettuce, tomato, onion), must be fresh. Bread: Must have a baked crunch but be neither too hard nor too soft. Meat Selection: Turns out that the only meats on Italian hoagies in Pittsburgh are salami and ham, plus provolone cheese. I never realized this. So this category turned into more of a “Meat taste” than meat selection. Accompaniments: This didn’t factor into the overall score, but we did take note of them. Price was not factored in, though they ranged from $6.95- 11.25. Contender #1: Sam’s Subs, Fox Chapel. Second Runner up with 8 points, mostly due to a poor showing on veg freshness and authenticity. The meats were heated up on the griddle, which gave them a bit of a char, and the actual sandwich wasn’t baked, so the bread was too soft. However, the excellent French fries would be a reason to go back, even though they did not factor into voting. Overall Winner with 10.5 points, this sandwich scored no lower than a 2 in any one category, with a 3 for authenticity and “generous chips” as the accompaniment. Perfect amount of dressing, fresh veg, and nice crust on the bread. Exactly what I was looking for. So there you have it. If you ever feel like eating a lot of processed meat to get your fix of an authentic Pittsburgh hoagie, run down to Veltre’s and enjoy! Note: Now that I’m back in Boston, I will say that perhaps the best Boston sub is from Bob’s. And I do enjoy the pickles.